We often take our dryers for granted, right until they break down. When your dryer at your home is not properly working, it will definitely create not only extra work, but also trouble for you just to get your clothes dry. If you will stay on top of the dryer repair need, you are more likely to have a working as well as fully functional laundry room for the future years to come. Otherwise, you could be spending longer hours hanging the wet clothes up on line or shelling out huge amount of money for an expensive new dryer. At Dr. Appliance, we offer dryer repair services you can take advantage of. We are a team of professionals who have what it takes to repair numbers of issues that your dryer is suffering from. Whether you are searching for drying machine repair or maintenance, we will always get you covered. We at Dr. Appliance are dedicated and committed when it comes to providing high quality dryer repair services you cannot find anywhere else. We will serve as your ultimate partner when it comes to finding services that are next to none. As your most trusted option, we will deliver quick services that come in cost competitive prices. Whether your dryer is leaking, smells bad, or would not start, our technicians can repair regardless how big or small the dryer problem is. Our highly trained and licensed technicians are guaranteed to help fix all your dryer repair needs. Wonder if your dryer at home is working properly? 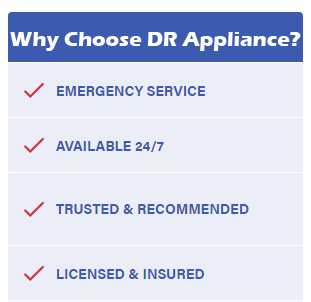 Listed below are some of the signs indicating that your dryer needs dryer repair services from Dr. Appliance. It is making disruptive noises. The drum is not tumbling. The clothes are not getting dried. If the outside of your dryer is not turning on, this is a symptom that may not be completely an indicator that your prompt dryer repair is needed. Most homeowners might think that it is easier to put off addressing the issues. DIY repair is one thing you can do, but trying to work around your malfunctioning dryer rather than fixing it is definitely not a great decision at all. What will happen if you ignore these signs? Ignoring the problems for too long could lead to your dryer being damaged beyond dryer repair. It will absolutely require you to buy new dryer and deal with the stress and hassle of new appliance installation. Dr. Appliance is aware of these things. This is why we make sure that our dryer repair services are always available. If you are looking for the best dryer repair services provider in town, Dr. Appliance is the best choice you can consider. We can repair different dryer problems as quickly as possible. We know how important your dryer is for you, so we guarantee you fast and reliable services. Call us now at (phone number) to know more about our dryer repair services.